PFS Group are approved distributors and installers of the Filofrom products for Australia and New Zealand. For expert advice or just more information regarding the supply and or installation for any of the Filoform Seal Systems please contact. Duct sealing systems MDIII have been developed to an provide effective and simple solution for Gas and Watertight sealing of cables / pipes in ducts or bore holes. This duct sealing system is extremely flexible and can be installed in ducts vertically and horizontaly. The effective and ‚easy to install’ solution to gas and watertight as well as fire proof duct sealing requirements. Filoform duct Sealing systems have been used for decades to provide Gas and Watertight sealing. These seals can now be made Fire resistant up to 2 hours by finishing them with the special "MD+ Fire resistant sealant". Filoform duct sealing systems are based on a specially formulated expanding 2-component polyurethane resin. This resin is packed in a transparent twin pack prepared for a filling nozzle. After removing the separation strip, the 2 components should be thoroughly mixed for 30 seconds. The resin is now ready for use and the twin pack can easily be openend by installing the screw type filling nozzle. After pouring the resin in, the resin expands due to the formation of CO2. During this expansion, the resin penetrates into all gaps thus filling these completely. This proces takes place independant from the shape of the duct and independant from the diameter and number of cables or tubes. After this, the expanded resin will cure and form a durable gas- and watertight seal with excellent mechanical strength. 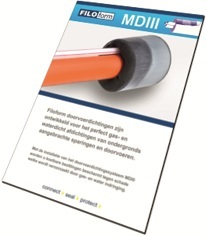 Use of the special MD+ Fire Resistant Sealant in combination with Filoform MD-Duct Sealing Systems provides fire resistance up to 2 hours in conformity with the standard EN1366-3:2009*. Filoform duct sealing systems can thus be easily adjusted to the requirements in a specific situation. Duct sealing system type MD IV is suitable for quick and easy sealing of empty ducts / boreholes where cables or pipes are to be installed at a later date. The system provides an effective Gas and Watertight seal. 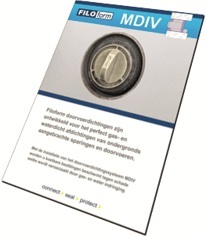 Suitable for ducts with a diameter of 75mm up to 160mm.